On May 3, 2016, the California Supreme Court held argument on two Indian Child Welfare Act Cases—only the third and fourth times that the high court has accepted an ICWA case since 1991. California Indian Legal Services has participated in all four cases: Slone v. Inyo County (1991); In re W.B. (2012), and filed amicus briefs in the two 2016 disputes. In both of this term’s cases, Abbigail A. and Isaiah W., CILS presented oral argument before the state Supreme Court. Watch the live feed of the Supreme Court of California Oral Argument. 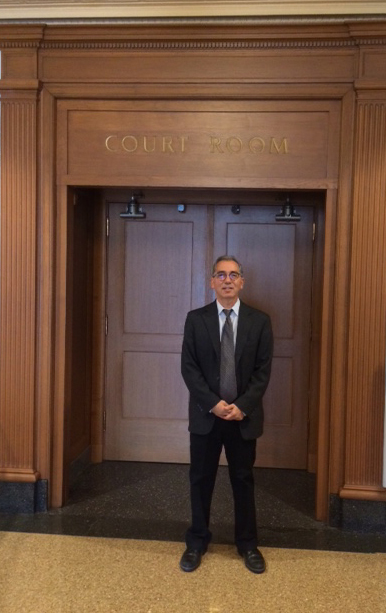 Mark Radoff, Escondido Senior Attorney, at the California Supreme Court. At issue in Abbigail A. was whether Social Services has an obligation to assist an Indian child with her enrollment application after the Cherokee Tribe acknowledged her eligibility, but her father had not yet enrolled. Sacramento County Social Services opposed assisting, and objected to application of the ICWA while Abbigail’s application was pending. 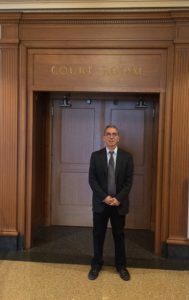 Isaiah W. addressed whether a mother forfeited her right to raise ICWA notice violations by not appealing at the early-stage dispositional hearing. Notice and application of the ICWA are a continuing, and case long obligation, but Los Angeles County took a one-strike-and-you’re-out position, that the mother was permanently precluded from raising ICWA violations at later hearings—even if the violations adversely affected a tribe that had not received notice, and could not yet participate. Both Abbigail A. and Isaiah W. are under submission at the Court and a ruling is expected within 90 days.